The pigeon pea (Cajanus cajan) is a perennial legume from the family Fabaceae. Since its domestication in the Indian subcontinent at least 3,500 years ago, its seeds have become a common food in Asia, Africa, and Latin America. It is consumed on a large scale mainly in South Asia and is a major source of protein for the population of the Indian subcontinent. The pigeon pea is known by numerous names in various languages around the world. Since there are many languages in the Indian subcontinent, there is a plethora of names used for this legume in that region. toor dal (तूर दाल) or arhar dal (अरहर दाल), two equally popular names in Hindi. The original word in Hindi and other northern / eastern languages is arhar, but the southern toor has been widely accepted over the past century or so. Fio fio in the Igbo language of south-east Nigeria. 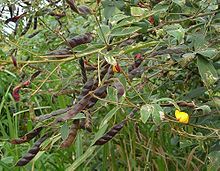 Pigeon pea is a perennial which can grow into a small tree. The cultivation of the pigeon pea goes back at least 3,500 years. The centre of origin is probably peninsular India, where the closest wild relatives (Cajanus cajanifolia) occur in tropical deciduous woodlands. Archaeological finds of pigeon pea dating to about 3,400 years ago (14th century BC) have been found at Neolithic sites in Kalaburagi, Karnataka (Sanganakallu) and its border areas (Tuljapur Garhi in Maharashtra and Gopalpur in Orissa) and also the south Indian states such as Kerala, where it is called Tomara Payaru. From India it traveled to East Africa and West Africa. There, it was first encountered by Europeans, so it obtained the name Congo Pea. By means of the slave trade, it came to the American continent, probably in the 17th century. Today, pigeon pea is widely cultivated in all tropical and semitropical regions of both the Old and the New Worlds. World production of pigeon peas is estimated at 4.49 million tons. About 63% of this production comes from India. Africa is the secondary centre of diversity and at present it contributes about 21% of global production with 1.05 million tons. Malawi, Tanzania, Kenya, Mozambique and Uganda are the major producers in Africa. The total number of hectares grown to pigeon pea is estimated at 5.4 million. India accounts for 72% of area grown to pigeon pea or 3.9 million hectares. Pigeon pea is an important legume crop of rainfed agriculture in the semiarid tropics. The Indian subcontinent, eastern Africa and Central America, in that order, are the world's three main pigeon pea-producing regions. Pigeon peas are cultivated in more than 25 tropical and subtropical countries, either as a sole crop or intermixed with cereals, such as sorghum (Sorghum bicolor), pearl millet (Pennisetum glaucum), or maize (Zea mays), or with other legumes, such as peanuts (Arachis hypogaea). Being a legume capable of symbiosis with Rhizobia, the bacteria associated with the pigeon pea enrich soils through symbiotic nitrogen fixation. Pigeon peas can be of a perennial variety, in which the crop can last three to five years (although the seed yield drops considerably after the first two years), or an annual variety more suitable for seed production. The crop is cultivated on marginal land by resource-poor farmers, who commonly grow traditional medium- and long-duration (5–11 months) landraces. Short-duration pigeon peas (3–4 months) suitable for multiple cropping have recently been developed. Traditionally, the use of such input as fertilizers, weeding, irrigation, and pesticides is minimal, so present yield levels are low (average = 700 kg/ha). Greater attention is now being given to managing the crop because it is in high demand at remunerative prices. Pigeon peas are very drought-resistant and can be grown in areas with less than 650 mm annual rainfall. With the maize crop failing three out of five years in drought-prone areas of Kenya, a consortium led by the International Crops Research Institute for the Semi-Arid Tropics (ICRISAT) aimed to promote the pigeon pea as a drought-resistant, nutritious alternative crop. Successive projects encouraged commercialization of legumes, by stimulating the growth of local seed production and agro-dealer networks for distribution and marketing. This work, which included linking producers to wholesalers, helped to increase local producer prices by 20–25% in Nairobi and Mombasa. The commercialization of the pigeon pea is now enabling farmers to buy assets, ranging from mobile phones to productive land and livestock, and is opening pathways for them to move out of poverty. John Spence, a botanist and politician from Trinidad and Tobago, developed several varieties of dwarf pigeon peas which can be harvested by machine, instead of by hand. Involves water soaking, sun drying and dehulling. Involves oil/water application, drying in the sun, and dehulling. Depending on the magnitude of operation, large-scale commercial dehulling of large quantities of pigeon pea into its deskinned, split version, known as toor dal in Hindi, is done in mechanically operated mills. Pigeon peas are both a food crop (dried peas, flour, or green vegetable peas) and a forage/cover crop. In combination with cereals, pigeon peas make a well-balanced meal and hence are favoured by nutritionists as an essential ingredient for balanced diets. The dried peas may be sprouted briefly, then cooked, for a flavor different from the green or dried peas. Sprouting also enhances the digestibility of dried pigeon peas via the reduction of indigestible sugars that would otherwise remain in the cooked dried peas. In India, split pigeon peas, called tur (तूर) in Marathi, toor dal (तूर दाल) or 'arhar' (अरहर) in Hindi and arehar ki dal in Urdu, kandhi pappu (కంది పప్పు) in Telugu, thuvara parippa in Kerala and thuvaram paruppu in Tamil Nadu, togari bele in Kannada are one of the most popular pulses, being an important source of protein in a mostly vegetarian diet. In regions where it grows, fresh young pods are eaten as a vegetable in dishes such as sambar. Whole pigeon peas are called arhar dal in Hindi. In Ethiopia, not only the pods, but also the young shoots and leaves are cooked and eaten. In some places, such as the Caribbean coast of Colombia, Dominican Republic, Panama and Hawaii, pigeon peas are grown for canning and consumption. A dish made of rice and green pigeon peas (called moro de guandules) is a traditional food in the Dominican Republic. Pigeon peas are also made as a stew, with plantain balls. In Puerto Rico, arroz con gandules is made with rice and pigeon peas and is a traditional dish, especially during Christmas season. Trinidad and Tobago and Grenada have their own variant, called pelau, which includes either beef or chicken, and occasionally pumpkin and pieces of cured pig tail. In the Atlantico department of Colombia the sopa de guandú con carne salada (or simply "gandules") is made with pigeon peas. Unlike in some other parts of the Greater Caribbean, in The Bahamas the light brown colored dried seeds of the pigeon pea plant are used (instead of the fresh green pigeon peas used elsewhere) to make the heartier, heavier, signature Bahamian staple dish "Peas 'n Rice." A slab of partially cubed or diced pork "fatback" lard with skin on (bacon is a common substitute), diced onions and sweet pepper, and a mixture of spices are all sauteed in the bottom of a deep pot. Tomatoes and tomato paste are added. Then water is added along with the peas and rice, and slow boiled until tender. The dish becomes a medium-dark brown color, resulting from absorbing the colors of the browned initial ingredients and the cooked tomato paste. The pigeon peas themselves absorb the same, becoming a much darker brown, providing some contrast while still complementing the distinctive "browned" theme of the dish. In Thailand, pigeon peas are grown as a host for scale insects which produce lac, the key ingredient in shellac. Pigeon peas are in some areas an important crop for green manure, providing up to 90 kg nitrogen per hectare. The woody stems of pigeon peas can also be used as firewood, fencing and thatch. It is an important ingredient of animal feed used in West Africa, especially in Nigeria, where it is also grown. Leaves, pods, seeds and the residues of seed processing are used to feed all kinds of livestock. The pigeon pea is the first seed legume plant to have its complete genome sequenced. The sequencing was first accomplished by a group of 31 Indian scientists from the Indian Council of Agricultural Research. It was then followed by a global research partnership, the International Initiative for Pigeonpea Genomics (IIPG), led by ICRISAT with partners such as BGI–Shenzhen (China), US research laboratories like University of Georgia, University of California-Davis, Cold Spring Harbor Laboratory, and National Centre for Genome Resources, European research institutes like the National University of Ireland Galway. It also received support from the CGIAR Generation Challenge Programme, US National Science Foundation and in-kind contribution from the collaborating research institutes. It is the first time that a CGIAR-supported research center such as ICRISAT led the genome sequencing of a food crop. There was a controversy over this as CGIAR did not partner with a national team of scientists and broke away from the Indo American Knowledge Initiative to parallelly start their own sequencing. The 616 mature microRNAs and 3919 long non-codingRNAs sequences were identified in the genome of pigeon pea. The following table indicates completeness of nutritional profile of various amino acids within mature seeds of pigeon pea. As can be seen from the table above, Methionine+Cystine combination is the only limiting amino acid combination in pigeon pea. In contrast to the mature seeds, the immature seeds are generally lower in all nutritional values, however they contain a significant amount of vitamin C (39 mg per 100 g serving) and have a slightly higher fat content. Research has shown that the protein content of the immature seeds is of a higher quality. ^ "Rabi (winter) and Kharif (monsoon) crops". www.agrinfobank.com.pk. Agri info. 2017-12-06. Retrieved 8 June 2018. ^ Fuller, D. Q.; Harvey, E. L. (2006). "The archaeobotany of Indian pulses: Identification, processing and evidence for cultivation". Environmental Archaeology. 11 (2): 219–246. doi:10.1179/174963106x123232. ^ a b "FAOSTAT". www.fao.org. Retrieved 2018-02-28. ^ "John Spence (1929) Plant Pathologist". National Institute of Higher Education, Research, Science and Technology. Retrieved 2015-02-24. ^ Pigeonpea in Eastern and Southern Africa Archived 2014-07-18 at the Wayback Machine, ICRISAT Posted 10 October 2012. Downloaded 26 January 2014. ^ "Tru Bahamian Must Eats: Peas & Rice". Tru Bahamian Food Tours. Archived from the original on 12 January 2015. Retrieved 12 January 2015. ^ Adu-Gyamfi, Joseph J.; Myaka, Fidelis A.; Sakala, Webster D.; Odgaard, Rie; Vesterager, Jens M.; Jensen, Henning Høgh (2007). "Biological nitrogen fixation and nitrogen and phosphorus budgets in farmer-managed intercrops of maize-pigeonpea in semi-arid southern and eastern Africa". Plant and Soil. 295 (1–2): 127–136. doi:10.1007/s11104-007-9270-0. ISSN 0032-079X. ^ "ICRISAT-led global team cracks pigeonpea genome". Retrieved 2014-12-21. ^ Varshney, RK; Chen, W; Li, Y; et al. (January 2012). "Draft genome sequence of pigeonpea (Cajanus cajan), an orphan legume crop of resource-poor farmers". Nat. Biotechnol. 30 (1): 83–9. doi:10.1038/nbt.2022. PMID 22057054. Retrieved 2014-12-21. ^ Singh, NK; Gupta, DK; Jayaswal, PK; Mahato, AK; Dutta, S; Singh, S; Bhutani, S; Dogra, V; Singh, BP; Kumawat, G; Pal, JK; Pandit, A; Singh, A; Rawal, H; Kumar, A; Rama Prashat, G; Khare, A; Yadav, R; Raje, RS; Singh, MN; Datta, S; Fakrudin, B; Wanjari, KB; Kansal, R; Dash, PK; Jain, PK; Bhattacharya, R; Gaikwad, K; Mohapatra, T; Srinivasan, R; Sharma, TR (2012). "The first draft of the pigeonpea genome sequence". J. Plant Biochem. Biotechnol. 21: 98–112. doi:10.1007/s13562-011-0088-8. PMC 3886394. PMID 24431589. ^ Nithin, Chandran; Thomas, Amal; Basak, Jolly; Bahadur, Ranjit Prasad (2017-11-15). "Genome-wide identification of miRNAs and lncRNAs in Cajanus cajan". BMC Genomics. 18 (1): 878. doi:10.1186/s12864-017-4232-2. ISSN 1471-2164. PMC 5688659. PMID 29141604. ^ "Nutrition Facts and Analysis for Pigeon peas (red gram), mature seeds, raw"
Wikimedia Commons has media related to Cajanus cajan. Singh, Nagendra K.; et al. (2011). "The first draft of the pigeonpea genome sequence". Journal of Plant Biochemistry and Biotechnology. 21: 98–112. doi:10.1007/s13562-011-0088-8. PMC 3886394. PMID 24431589. Varshney, Rajeev K; et al. (2011). "Draft genome sequence of pigeonpea (Cajanus cajan), an orphan legume crop of resource-poor farmers". Nature Biotechnology. 30 (1): 83–9. doi:10.1038/nbt.2022. PMID 22057054.